In spite of being something of a world traveller, Johannesburg (JNB) and South Africa (my first visit was last year to Cape Town) has passed me by, writes BTN editor-in-chief Malcolm Ginsberg. And now it has happened. On the way to and from that dot in the ocean that is St Helena – two days on the ground outbound from the UK and one on the way back. It's a start. From London, there are five daily non-stop flights, and numerous alternative routings via European points, Addis Ababa and the Gulf states. I chose Virgin Atlantic. Eleven hours in the stretched Boeing B787-9 Dreamliner is not that tiring, even at the back (choose an aisle seat if you can). Perhaps it is because there is only a 1hr time difference or the fact that the aircraft pressurisation is similar to that at sea level. Passengers in Upper Class have the use of the Virgin Clubhouse at Heathrow, still one of the best lounges anywhere in the world. Dine before your flight. Shoe shine for free, and a head massage, or you can spend in whatever currency you like and take advantage of the extensive spa. There is also one at JNB, nicely laid out, just as friendly, but since it is serving a single flight a day, it is limited with its offerings. Upper Class on the way back means a proper flat-bed, not a seat that goes flat, a bar, and the largest airborne restrooms yet experienced, ideal for changing into a sleeper suit or preparing for the arrival. South African wines, of course, and a decent size one-piece table for the excellent meal. It is Business Class-plus, which was where Richard Branson originally pitched the product. Wi-fi at £4.99 for 40mb is plenty for dealing with one’s email, or you can buy unlimited access for £14.99. It works at normal ground-level speeds. OR Tambo International Airport is as good as any in the world with a speedy immigration hall and just a quick passport stamping for those on EU paperwork. Outbound was easy too, with a large duty-free hall and plenty of (inexpensive) catering. Clear signage and a phone call to my residence for two days, The Fairlawns, a 5-star boutique property in the upmarket Santon suburb, took me the few steps to the Gautrain station for Malboro. The fine high-speed train was about the only expensive element of my short South African sojourn, at around £10 for a 9min ride. In a secluded and very quiet grove, The Fairlawns offers quality dining, every facility needed and excellent service. Open fires, antique furniture and marble-decked bathrooms giving the Fairlawns’ suites a country-house feel. If your requirement is for a very private and exclusive stay, the Villa Moji is ideal, a fully-serviced residence featuring two en-suite bedrooms opening on to a patio with direct access to the garden and extra-length private swimming pool. There is private car parking, a full kitchen (chef available) and separate dining room. Most of the facilities are wheelchair accessible. All schoolchildren in South Africa know the name Liliesleaf Farm, “A Place of Liberation”. The Rivonia Trial will ring a bell with readers who are interested in South Africa and the history of apartheid. 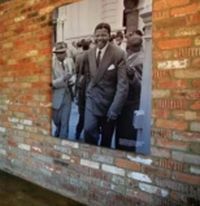 If you have seen the film Mandela – A Long Walk to Freedom or read the book from which it was developed, you will know about the farm purchased by members of the South African communist party in 1961 as a safe-house for political refugees. The farm, in the Johannesburg suburb of Rivonia, employed Nelson Mandela under the assumed name of David Motsamayi as a worker in blue overalls. He was not to stay long and by the time of the infamous raid at the farm on 11 July 1963 he was already serving a five-year jail sentence on Robin Island for subversion. Security police captured 19 members of the African National Congress (ANC), latterly charging them with sabotage. Eight members, including Mandela, were sentenced to life imprisonment on Robin Island. They were not unhappy. It could have been the ultimate punishment. Now one of South Africa’s most important tourist venues, Liliesleaf Farm is an easy place to visit, easily arranged through the Fairlawns concierge and just 15min away. Tours begin with a 12min video film and visitors can then either join a group or use an audio tour. The property has been carefully renovated and is a middle-class white residence of the period. 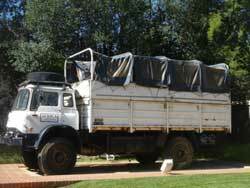 Much archive material is available and also on display is a remarkable Bedford truck, specially built in the 1980s for a tour operator called African Hinterland. Genuine tourists were sold trips but, unknown to them, buried deep under the floor of the truck were arms and ammunitions for the ANC’s struggle. Under this disguise, it visited many places, mainly in East Africa during this period, covering 40 expeditions. Remarkably, it was never found out at any border crossing or police search. Set aside at least a couple of hours for the tour. Off to St Helena after two nights, and then back for another 24hr stay. Maboneng, an inner suburb of Johannesburg, can be compared with London’s Shoreditch, less than one mile from the city centre, but a world apart. Until recently a decaying light industrial district, and no-go even in daylight, it is now in a period of renaissance, and very much a trendy area for the young. Cycle tours can be organised and there is a free shuttle bus which takes visitors on a circular tour, the local driver very keen to promote his part of South Africa’s biggest city. Large areas are occupied by the Technikon Witwatersrand, which is now a part of the University of Johannesburg, Ellis Park Stadium and Johannesburg (Athletics) Stadium. Much of it is being developed by property group Propertuity, which is also responsible for the Hallmark House accommodation complex, still being developed. This old warehouse has been cleverly redeveloped to incorporate 46 hotel bedrooms and eight floors of residential apartments surmounted by a soon-to-be opened spa and bar on the rooftop, with 360deg views of the city. On the ground floor is Loof Coffee bar, a branch of a Joburg fixture, peddling macchiatos and cortados brewed from custom-roasted beans, and underground is a jazz club and barber – the latest de rigueur amenity for any hip hotel. It is a trendsetter that is just getting under way, with excellent courtesy wi-fi and the amenities of a 4-star hotel. Market on Main, a busy meeting place, is a 12min walk from Hallmark House, while the PopArt Theatre, The Bioscope and Arts on Main are all within half a mile.